If all the famous people gathered in a room, all attention would be on Nelson Mandela. He is, without a doubt, the most well-known and respected public figure in the world. And yet, as I personally experienced as a young South African diplomat serving in Washington D.C. during the apartheid-to-democracy transition period—when such gatherings of the famous took place—Nelson Mandela made an effort to seek out and recognize the invisibles: the waiters, the doorman, the kitchen staff, the security. In his own writings and in interviews, he was at pains to stress that he was no saint. He said he was an ordinary man, with the same fears, self-doubts, and vanities we all share. He acknowledged that he neglected his first family, and one can see from his early photos that he enjoyed his handsomeness, especially in a good suit. He had a great need to be liked and was able to muster considerable charm to win over any doubters. Once you were won over, however, he would expect loyalty, and he would lead with conviction and principle–his need for recognition never translated into him bending to the wind of popular opinion. For instance, referring to his arrest, sentencing (which could have been the death penalty) and imprisonment, he explained that to act brave, one needs to pretend to be brave. His message to us is that this was not somehow a unique character trait that he was born with, but rather that we can all be as brave as Mandela if we choose to act that way. He was a political firebrand in his youth. He led the African National Congress away from a decades-long legacy of peaceful civil disobedience, formed an armed wing, sought military training, and started a campaign of sabotage against government targets for which he was convicted and placed on terrorism lists all over the world. Yet, somehow what lied at the core of his personality matured over the years in prison and formed him into the enormously disciplined and principled person South Africa and the world got to know after his release from prison. He was unwavering in his loyalty to those that supported the anti-apartheid struggle, even when people like Qaddafi disappointed him on other counts. He was stubborn in his convictions; for example, he supported retaining some of the old national sporting symbols (as depicted in the film Invictus), despite strong opposition from his closest advisors and supports. 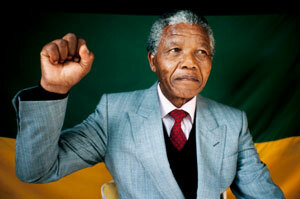 His greatest legacy was his strong principled support for reconciliation. Somehow, despite spending most of his adult life as a prisoner of the apartheid government, he reached a peace deal that offered the very rights and protection he was denied by negotiating with those who imprisoned him. Mandela was not, of course, solely responsible for the ultimately peaceful South African transition. We were blessed by a convergence of extraordinary personalities, including F. W. de Klerk, Desmond Tutu, Cyril Ramaphosa and Thabo Mbeki. Mandela would also have been at pains to stress the role that most ordinary South African played over this period to ensure, through goodwill, sacrifice, and dedication, that the transition from apartheid to democracy was managed without the country lapsing into violent conflict. It is somehow overlooked, but more than 4,000 people lost their lives over this volatile period, through political violence unleashed by white and black extremist and secret rogue pro-apartheid government agents. The most critical moment during the South African transition was the assassination of Chris Hani on April 10, 1993. At the time of his murder, he led the South African Communist Party and headed the armed wing of the African National Congress. If he had survived, he most likely would have been South Africa’s president today. His murder came at a highly sensitive time in the South African transition, and it brought the country to the brink of civil war. It was later proven in court to be an attempt by right-wing extremists to derail the process leading to the end of apartheid. On the day of the assassination, Nelson Mandela made an impassioned call for calm during a national television broadcast. His message emphasized reconciliation and the rule of law, and his plea, together with similar calls by many other South African leaders from different constituencies, managed to contain the unrest and violence that followed in the wake of Hani’s assassination. It is fair to say that if we did not have the leadership and moral courage of Nelson Mandela during that critical period in our transition, the South African story would have been very different. Some see the shadow of that alternative future in the troubles that are plaguing South Africa today. However, Mandela’s ultimate legacy is that he has laid a solid foundation for South Africa’s post-apartheid future in the form of a robust constitution, independent judiciary, strong institutions, resilient economy, and a significant role in Africa and on the international stage. That foundation is so solid that the scope of the challenges we South Africans face today, and are likely to face in the conceivable future, will not be able to drive South Africa backwards into violent conflict. By leading us through that uncertain period, and by laying a solid foundation for our future, he has an enormous impact on the everyday life of every South African. Cedric de Coning is a Senior Research Fellow at the African Center for the Constructive Resolution of Disputes (ACCORD) and the Norwegian Institute of International Affairs (NUPI). About the photo: Nelson Mandela shows the freedom salute after his release from prison, Johannesburg, South Africa, February 13, 1990.